I’ve blogged in the past about my morning workout – hiking with friends outdoors. And now that we’re in the nice summer weather it’s been great to spend more time outdoors. I wanted to have a goal in my exercise program and inspired by a lecture given by Alison Levine my husband Steve and I decided to set our goal as summitting Mt. Whitney. A little bit about Mt Whitney is here. It is of course the highest peak in the contiguous US at 14,500 feet. Interestingly, during the summer months, when the snow is melted, it is considered not to be a “technical climb”. Trail head to summit is 11 miles each way with an elevation gain of about 6000 feet. As much as I like hiking, my Great Neck (Jewish American Princess HQ) origin didn’t lead me to be big on camping. Hike hard outside during the day then sleep/shower indoors is my preference. It turns out that Mt. Whitney can be done as an extreme day hike lasting about 18 hours. It is easier to get permits doing the day hike and the whole process is simpler in terms of gear and supplies. So that’s our plan. Getting permits is actually a democratic lottery system. We applied and got our second choice date – July 31 – very lucky. We particularly wanted this date as it directly follows our family vacation where we will be in Colorado for a week. Now that the wedding has passed we are training more seriously – trying to step up our regular workout schedule. Adam will be joining us for the hike – he of course has the advantage of youth and is in the midst of summer football workouts. All three of us need to increase the duration of our workouts and find some opportunities to workout at altitude. My normal weekday morning hike is 3-5 miles and weekend is 6-7. I’m trying to increase the weekday amount (more challenging with work schedules) and do at least one 10-12 mile hike each weekend. One of our favorite weekend hikes is Windy Hill. That trail is 6 miles and 2000 feet gain – usually takes us a little less than 2 hours. Steve figured out that if we can do that 3 times in a row – it is a similar length and elevation to Whitney – though of course much easier by being at sea level. Weight lifting twice a week is part of the routine. My trainer Matt MacNamara at SterlingWins has me doing a fairly traditional set of strength exercises. I’m trying to push this harder but mostly be more consistent. I’m not a huge road biking fan but to break up the hiking I’m trying to do one ride per week – we have a great 20 mile loop through Menlo Park/Portola Valley/Woodside that I enjoy. I’ve always liked hiking in the hills near my home and in the mountains when I travel. In future blog posts I’ll talk more about the specifics. I’m really excited about this challenge. 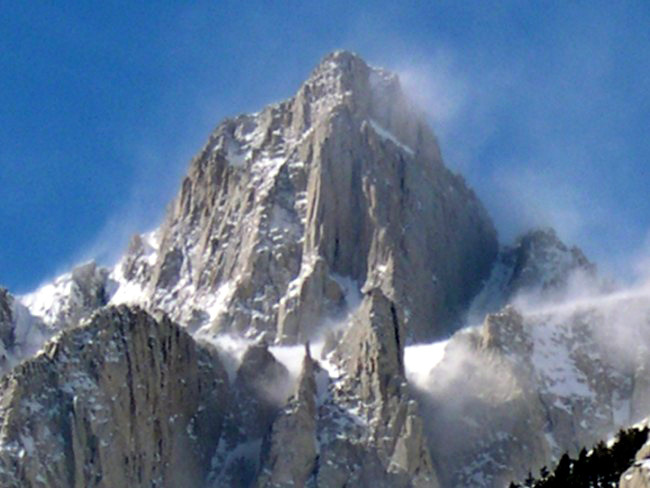 This entry was posted in Fitness and tagged Mount Whitney by lyecies. Bookmark the permalink. I’ve done this as a day hike 3 times. If you want to spend some time at the summit, bring warm clothes, regardless of the weather in Lone Pine, it is always quite cold up there. Typically, shorts are fine until you hit 13k feet. Try to summit around or before noon, osometimes on sunny days, Mount Whitney will gets its own storm cloud, with lightning that can build up quickly. Have a great trip!